Honour the memory of our veterans’ sacrifices on Canada’s Remembrance Day, November 11, with the R16005 Cross Weaving Mats! 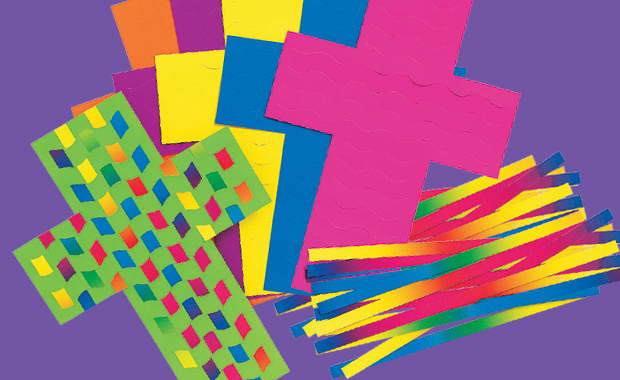 Weaving mats help to encourage fine motor development through the act of passing the weaving strips under and over each of the successive slits cut into the colorful card crosses. Make sure that the ends are taped off before you cut them. Once you have started on the next row, remember to start with the opposite direction. For instance, instead of starting your weaving over the slit, start under it and continue weaving over and under. This will vary up the appearance of the weaves and make it look like a checkered pattern. Use about 4 strips per weaving strip. The Cross Weaving Mats come in a range of different colors. Turn the card cross over to see another color on the flipside. As you weave, the colors of the weaving strips will also appear on the opposite side. You can paste the Cross Weaving Mats up on a wallboard or attach the crosses together on a banner and hang up in the classroom as Remembrance Day decorations! This entry was posted in Crafts and tagged armistice, cross weaving mats, fine motor development, remember, remembrance day, veterans, veterans day, weaves, weaving by roylcoblog. Bookmark the permalink.